Home Call Wedding Dress Alterations & Clothing Repairs in Surrey. I am really sorry but I unable to take on any more brides unless you are getting married in September onwards, until then I am completely full. I do however know of a highly skilled lady I can recommend (she is in Tunbridge Wells) so if you email me (jane@aperfectfit.co.uk) I can provide her details. 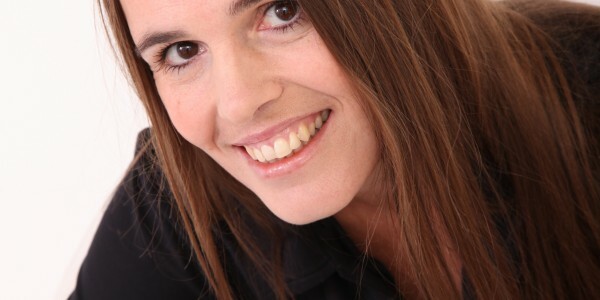 I am Jane Ecob, recognised as one of the top seamstresses in the UK. My speciality is working on altering and adjusting wedding dresses. I do this everyday and have worked on literally thousands of dresses over the last 30 years. I now have my new home studio up and running and so I will be transitioning my home call service with very limited slots available. Most fittings would now take place at my studio in Dorking meaning I can focus more of my time on actually sewing which I love and it means I don’t have to disappoint as many brides as I can take on more clients than was previously possible. From the age of 17 I served my apprenticeship to become a professional seamstress learning the skills to sew, pattern, cut and grade. Over the last 30 years I have worked on thousands of wedding dresses, bridesmaid’s dresses, mother of the bride outfits, designer dresses, trousers, cravats, prom dresses and evening wear. As well as my private clients I have worked for many highly-respected wedding dress shops in the Surrey area, fitting, adjusting and altering the dresses so a bride’s day is perfect with no stress or hassle. Perhaps you have lost weight or would just like to restyle? Whatever you want to achieve with your clothes, I can help you. Shapes change and rather than buying a whole new wardrobe, you can get more life out of your existing classic dresses or suits. Some sewing adjusting services on the high-street such as dry-cleaners will not be sure how to handle unusual fabrics such as chiffon and velvet. I can literally handle any expensive and precious items of clothing that need adjusting, repairing or altering without fear. I’m often working on rescue jobs that were poorly done in the first place! As one of the UK’s top dressmakers you are in safe hands with me! I am flexible and able to see you on evenings and weekends if that suits your lifestyle better. Wedding dresses – alterations and customisation. Made to measure & bespoke. Taking in and letting out bodices. Taking in – taking out. As a professional seamstress and dressmaker for over 30 years, I am able to handle any type of material and clothing you wish to be altered or repaired. With my home studio I am now able to do virtually all fittings in Dorking, this means I am able to see more brides than I could previously. For anyone unable to travel to me I can quote for a home visit but naturally I need to charge more to cover time and travelling expenses. Generally the area I cover is most of Surrey, northern parts of Sussex, western parts of Kent and Greater London (South). If I can’t help you I do know skilled seamstresses that I can recommend. I have visited clients in towns in Surrey such as Dorking, Farnham, Guildford, Great Bookham, East Horsley, Godalming, Bramley, Cranleigh, Epsom, Sutton, Banstead, Walton, Ashstead, Tadworth, Esher, Cobham, Ewell, Woking, Holmwood, Ockley, Reigate, Redhill, Horley, Merstham, Caterham, Oxted and Leatherhead. Also Horsham and Crawley in West Sussex are covered as are Purley, Sutton and Kingston in Greater London. Obviously prices will vary depending on styles, fabrics, how many items you have to be fixed as well as how complicated the work will be. This is my speciality and expertise – every single day I am working on different types of wedding dresses so you are in safe hands with me. A wedding dress needing shortening and a bodice adjustment would start from £195 or £225 if you have a more complex full circle wedding dress with several layers. As lace dresses are more complex and time consuming, these are usually from £285. If you can email a photo with a brief description of what you think needs doing and when your wedding date is, I am able to give you a very accurate quote. 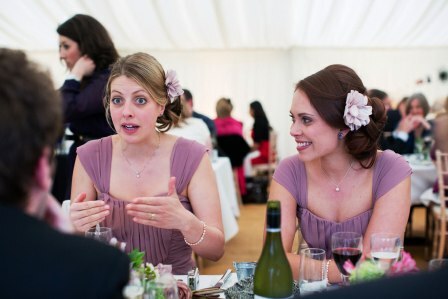 Bridesmaid dresses are around £65 for hem and side seam alterations. While I am making adjustments and alterations it is obviously economical for you to think of other items that may need work. I often pick up bundles of clothing and doing all of this work at once can work out to be very good value when you cost each item. Please either give me a call or even better – email me with an idea of what you need doing and if possible a photo or two. I’ll get back to you quickly with an accurate quote. Should you choose me you will be getting a highly trained seamstress who can do the jobs others would not touch. You are in safe hands with me and I will work with you to ensure an enjoyable stress-free experience! 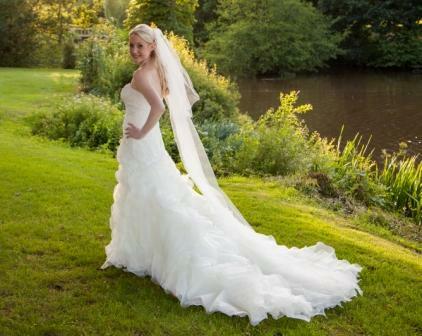 I wouldn’t hesitate in highly recommending wonderful Jane to be your dressmaker/seamstress for your big day. I couldn’t believe that I actually DID feel like a princess as I walked down the aisle in my beautiful dress. I had bought my dress in a designer sample sale and was worried about getting it to fit perfectly. Jane really does what her website attests! When she came to my house she was friendly, kind and extremely professional. As she set to work pinning the different layers of my dress I felt so happy and relieved! The French lace on my dress was particularly delicate and Jane handled it with care and expertise. Jane helped to cleverly hide my underwear with some discreet poppers and when I looked in the mirror I couldn’t stop smiling. Thank you so much Jane, I know you will bring confidence, joy and happiness to your next lucky bride. Every girl dreams of their wedding dress fitting them properly and looking like the most beautiful woman in the room on their wedding day. I decided on a wedding dress that was quite a challenge due to the bottom having individual pieces which needed to be adjusted. Jane took this in her stride and from the moment I met her, I knew I could trust her to alter my dress perfectly. It is quite nerve wracking watching your dress walk away with someone to take apart but at no point did I feel uncomfortable and nervous about Jane taking the dress. She gave me confidence in every part of the process and when I got the dress back, I was blown away. She had transformed a dress which was too big into something which fitted me perfectly and made my dreams come true. I was so happy with everything Jane did and I couldn’t recommend her more! She is incredible at what she does and if you want to find someone you can trust to create the dress of your dreams, Jane is your woman! 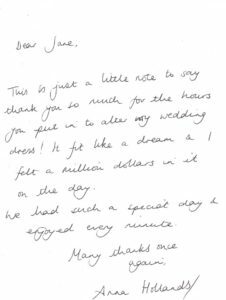 Jane, you rescued my Justin Alexander dress from the shop in Farnham who had a so-called alteration ‘expert’ – I am so glad I found you, as far as I am concerned you have to be the best dressmaker & seamstress for alterations in Surrey. I hope you are well. This is just a very belated email to say thank you! The alterations to our dresses were just perfect and we all felt completely relaxed and happy on the wedding day. I’ve also attached a couple of photos with the bridesmaids’ dresses and the lovely little cap sleeves you made. With many thanks once again, and wishing you all the best, Katherine. Click here to see my portfolio which has more examples of my work and feedback. A Perfect Fit is the company name of dressmaker and seamstress Jane Ecob - providing alteration, adjustment and repair to clothing especially wedding dresses in Surrey.